A beautiful bride before her wedding in Seguin, Texas. 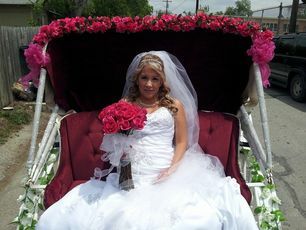 What little girl hasn't dreamed of arriving at her wedding in a beautiful carriage pulled by a white horse? 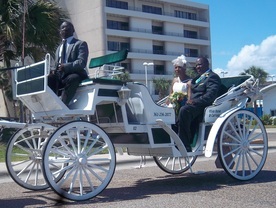 A carriage ride is the perfect way for a bride and her father to spend some quality time together before the wedding. All eyes will be on her when she makes her grand entrance in a horse drawn carriage. After the ceremony, the bride and groom can hop on the carriage and enjoy a private moment together as husband and wife. As the ride comes to an end, the bride and groom will be greeted by their loved ones as they arrive at their reception and celebrate the beginning of a new life together. Wedding in Corpus Christi, Texas. If you're ready to make your dreams a reality, Contact Us to discuss your special day. You can also visit us on Facebook to see more pictures of past events.